Alec Finlay has made two wooden box versions of his StoryCubes which are being exhibited in Thoughts Within Thoughts at Arc Projects Gallery in Sofia, Bulgaria (21st June -26th July 2008). About : This pair of cube poems can be viewed – or made – in the context of Finlay’s other poetic forms: the mesostic name poem; circle poems and the related windmill turbine text designs and wordrawings; and the grid poem and sliding puzzle poem objects derived from these. 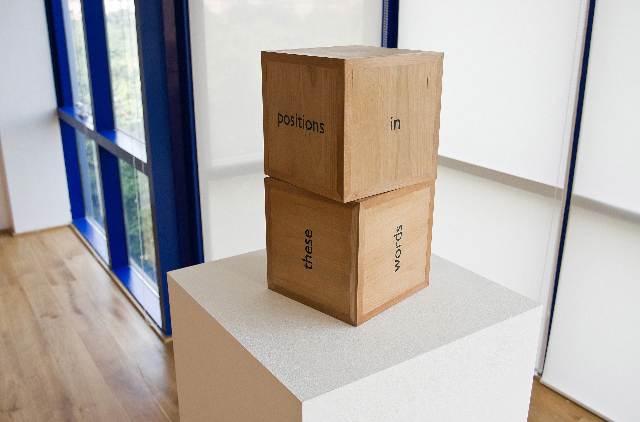 The text ‘your finger / my thumb’ was originally used in a performance collaboration with Dan Civico, for which Finlay made a handwritten circular wordrawing from these two phrases, while Civico folded origami cubes. Together with Guy Moreton and Michael Nedo, Finlay published Ludwig Wittgenstein: There Where You Are Not (Black Dog, 2005), a consideration of the Wittgenstein house at Skjolden in Norway. Finlay has produced a series of card cut-out nest-box schema, in collaboration with Jo Salter (available free from www.alecfinlay.com). His most recent publications are two fields of wheat seeded with a poppy-poem (Milton Keynes Gallery); Specimen Colony (Liverpool University Press) and One Hundred Year Star-Diary (platform projects). He is is currently showing in herz:rasen at Kunstlerhaus Vienna (until July 6), where he is exhibiting Labanotation: the Archie Gemmil goal (2002), a collaboration with Robin Gillanders; and now then at the Bluecoat (Liverpool). His next exhibition, thoughts within thoughts, a duet with Pravdoliub Ivanov will open at Arc projects (Sofia) in late June 2008.